Turkey has one of the highest numbers of native-born citizens living in other Organization for Economic Co-operation (OECD) countries, a report shows. 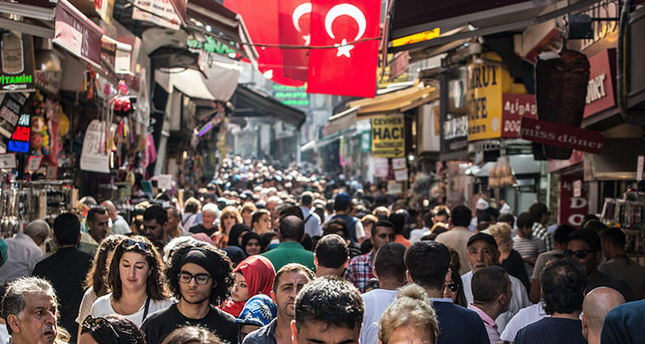 The figures reveal that 4.4 per cent of people over the age of 15 who were born in Turkey -- roughly 2.5 million -- were residing overseas in 2014. Turkey is the fourth-highest OECD country in terms of emigration. Anadolu Agency has spoken to experts and analysts, as well as Turkish migrants and Turks who want to leave, to find out the reasons why. "The biggest numbers of migrants consist of people who want to keep living in better conditions," says Prof. Murat Erdoğan. "During those days, there were demands from Europe as well as the Turkish government to encourage its citizens to migrate because there was not enough employment capacity in Turkey," Erdoğan says. The then Turkish government thought was that if citizens went to industrialized countries, they could eventually return with a working knowledge of industry and factory working systems. "Therefore, when Turkish migrants came back to the homeland with their skills, they would be beneficial for the country's development," Erdoğan says. Domestic conflicts fueled emigration. Turkey had faced problematic circumstances in the three decades between the 1960s and 1990s. These included incompatible government coalitions, two military coups -- in May 1960 and Sep. 1980 -- as well as the fall of two governments pushed to resign by the army -- once in March 1971 and again in Feb. 1997. Consequently, Turkish governments could not create stable life conditions for the country's citizens; on the other hand Europe had picked up the pieces after the Second World War. War-weary countries needed a new workforce. Turkey and Germany signed a recruitment agreement in Oct. 1961, as part of a "Gastarbeiterin" -- guest worker -- program, which allowed Turkish citizens to work freely in Germany. At the beginning of the migration flows, people were authorized to work in Germany for up to two years; however, "people have stayed there over 50 years," Erdoğan says. Turkish workers who went to Germany in the first "guest worker" flows did not speak German and had not received a vocational education, according to a report from Hacettepe-based German language expert, Prof. Sedat Şahin. Şahin also claimed that only 37 percent of the first-generation of Turkish migrants were skilled workers; the rest lacked qualifications or a trade, often relying on manual jobs. Today more than five million Turkish-origin people live in Europe; 3.2 million of these reside in Germany. Over half, roughly 1.6 million Turkish-origin migrants (including their children) have obtained German citizenship and fourth-generation Turks speak native-level German. The Turkish migration flows, which started 55 years ago mostly and included unskilled workers, have changed in recent years. Erdoğan says: "Nowadays there are also brain drains among the Turkey's native-born young people who wish to set up their own future in Europe, or anywhere in the world." Anadolu Agency spoke to a recent migrant, 29-year-old Meryem Adak who is a senior manager at LinkedIn, the Ireland-based business-networking service. She migrated to Dublin two years ago. Adak previously worked at a telecommunications company in Turkey. After two years in Ireland, she is preparing to turn back. Despite all the difficulties involved in leaving home, she and her husband preferred to go and live overseas. After the relocation, the first problem was her husband's work permit -- Turkish citizens still have no easy access to the employment market in Europe despite over 60 years of dealings with European countries. The couple's 18-month-old baby needed a touristic visa to enter Ireland, a country that has repeatedly rejected the Adaks as a "family"; therefore, they must leave and return to Irish territory every three months. Adak spoke about the difficulties in bringing up a child in foreign country: "My child cannot speak her mother tongue fluently yet because she has no [Turkish-speaking] friends to practice with here." A few weeks ago, Adak decided to come back to her homeland to continue her career, probably in less-rewarding standards but with better conditions. Although the main purpose of migration is getting a better job, Prof. Erdoğan underlines that there were other reasons for leaving, such as people who wanted to escape the political conditions in Turkey, especially after military coups. The number of citizens who have migrated abroad because of political exclusion is limited, so a second reason could be problems in accessing quality education at home. Many high-flying Turkish students prefer to study at overseas universities because recent rankings show that no Turkey-based colleges are in global top 250 lists. Many of the best universities are based in the United States and the United Kingdom, according to the Times Higher Education World University Rankings 2015-2016. Abdulbaki Türkmenoğlu is a junior lawyer who graduated from Istanbul University's Faculty of Law in 2014; he will migrate to London in a few months. Getting access to study for a master's and doctoral degree at an overseas university is fraught with challenges: "I have collected all the required documents: letters of acceptance from a university, language scores and grades," Türkmenoğlu says. The biggest challenge of the migration process was improving his English language ability; another difficulty was getting a scholarship because during foreign study students are generally unable to get a local work permit. He has a plan to return to Turkey after five years. Nevertheless, Prof. Erdoğan highlights that the number of the returned migrants have decreased considerably in previous years because of economic shrinkage and instability in Turkey.